If you’re a cannabis patient who requires regular medicating, dosing throughout the work day can be tricky. Even if your boss and coworkers know you use cannabis, odds are your job isn’t cannabis-friendly enough to let you puff your vape pen or smoke a joint at your desk. So, you need low-key options that make dosing during the work day (without getting too high) a cinch. 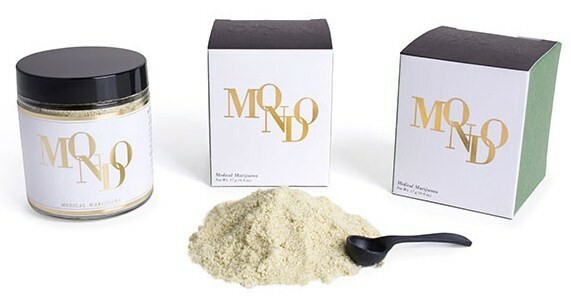 There are plenty of cannabis companies that understand us patients live busy lives; we need discreet ways to ingest medicine as they go through their daily routine. Here are some of the best and most incognito cannabis products in California. Ever wish you could get the effects of a vape pen without having to puff on one? That’s exactly what Mirth Provisions set out to do with their product, Drift, which looks like your everyday Binaca breath spray. Keep it in your pocket or purse and use it throughout the day without anyone thinking twice about the contents. The spray nozzle was expertly crafted to dose precise and repeatable sprays of 1.6mg THC every time, so you never have to worry about getting too stoned. Drift comes in four different flavors: sativa Wind River Mint, hybrid Cinnamon Springs, indica Lost Creek Lemon, and CBD North Coast Cranberry. 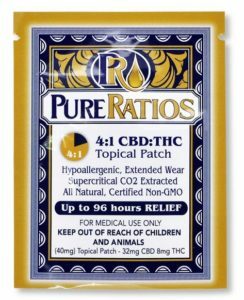 A 100mg bottle costs about $45. This is one of my favorite new products. Mondo is a low-calorie, fast-acting cannabis health powder made with the workplace in mind. Just dissolve one dose (a scoop) in your beverage (water, milk, smoothie) for a functional, upbeat high. Derived from Blue Dream, known for its euphoric creativity and productivity, the strain is grown by a single source organic farmer, pesticides and chemical free. What else is in this miracle product? Nothing but all-natural goodness including organic coconut oil, organic cacao butter, and non-GMO Maltodextrin. 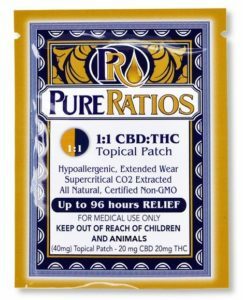 Get a 200mg THC jar for around $40. 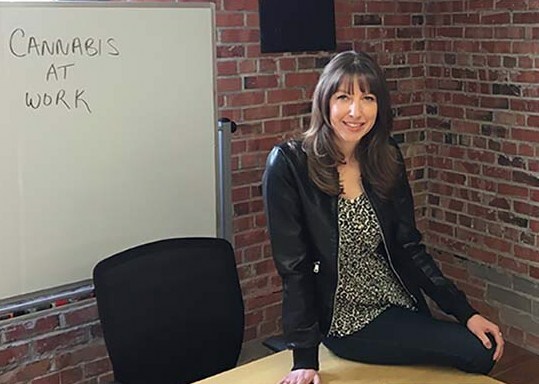 Prana is focused on legitimizing medical cannabis, creating products for those looking to try cannabis to treat their medical condition(s), but, like more these days, don’t want to smoke or vape. These bio nutrient capsules are perfect for those who prefer their cannabis in pill form. Prana makes four distinct capsules, each formulated to target a specific group of ailments by regulating your body’s endocannabinoid system: THC:THCa, 3:1 CBD, 1:1 CBD, CBD:CBN, and CBD:CBDa. They cover a wide range of medical issues including pain, arthritis, seizures, inflammation, depression, anxiety, PTSD, and insomnia. Most of their capsules come in activated or non-activated THC (great for the workday if you’re more sensitive to THC’s psychoactive effects). One package of Prana capsules will cost you a hefty $80-$100, but worth it if these help you lead a productive day. These tasty little pastilles will keep you feeling good all day long. Beboe prides itself on being a high end cannabis brand; with that, comes some pretty amazing packaging. Your officemates will never suspect that this beautifully designed candy tin is actually edible mmj unless they really looked closely. Each pastille is made with 5mg of sativa blend THC, 3mg of CBD, and a natural accelerant for fast absorption (an hour or less). The small dose of cold water hash cannabis will give you a perfect high to get you through the day. 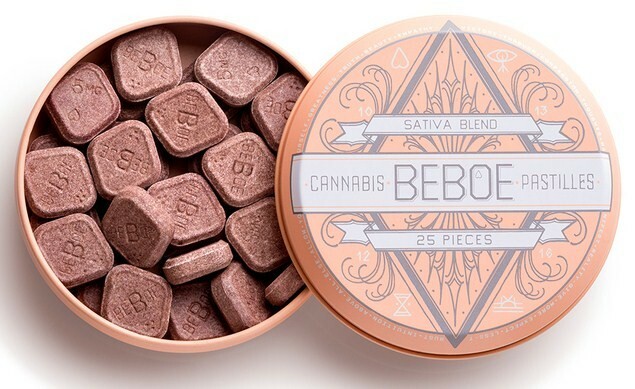 A 25-piece tin of Beboe Cannabis Pastilles will cost about $25. Just $1 per dose is a great bargain for this high end product. Do you suffer from aching muscle or joints? Your back and shoulders hurt after confined to sitting at your desk for hours? 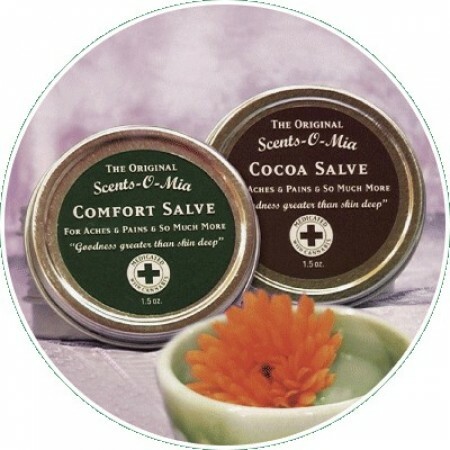 This salve is perfect for relief during the work day. Available in classic “Comfort” and “Cocoa,” Scent-O-Mia is a herbal and cannabis infused topical made with a blend of lemongrass-infused salve, coconut oil, beeswax, olive oil, cannabis oil, vitamin E, arnica, calendula, comfrey, eucalyptus, lavender, and camphor oils. These ingredients make it smell amazing and give the same soothing effect as non-cannabis menthol rubs. As soon as your fingers cramp or your back starts aching, rub a bit of this fast-acting salve directly to the affected area. You can get both versions for $30. 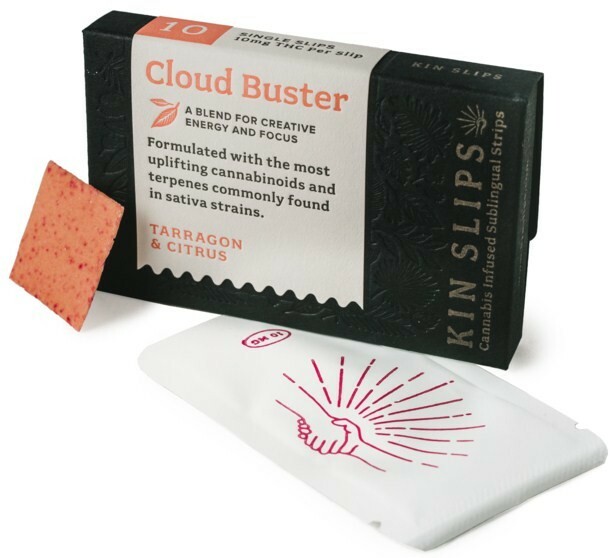 Kin Slips are an incredibly innovative and discreet sublingual cannabis product that looks a little like Listerine breath strips; just slip a strip under your tongue and wait 10-15 minutes for it to take hold. According to the company, sublinguals are superior to edibles because their onset takes less time and their effects aren’t distorted by stomach acids. 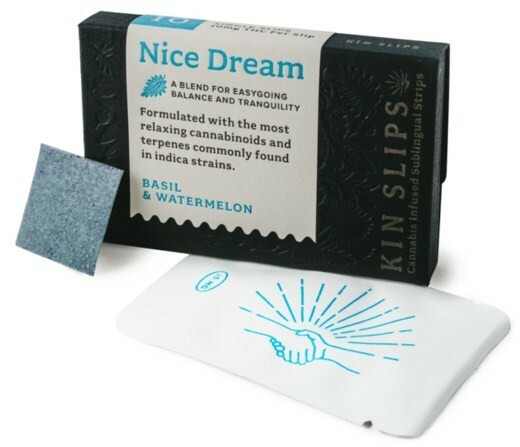 Kin Slips come in three different flavors, along with artfully detailed packaging, each formulated for a different high. Nice Dream is an indica formula that provides intense relaxation with a watermelon-basil flavor. 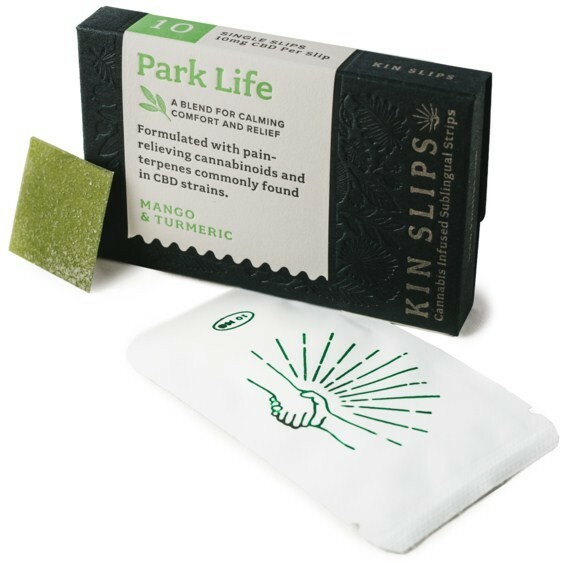 If you’re looking for a CBD-based option, try the mango-tumeric flavored Park Life. 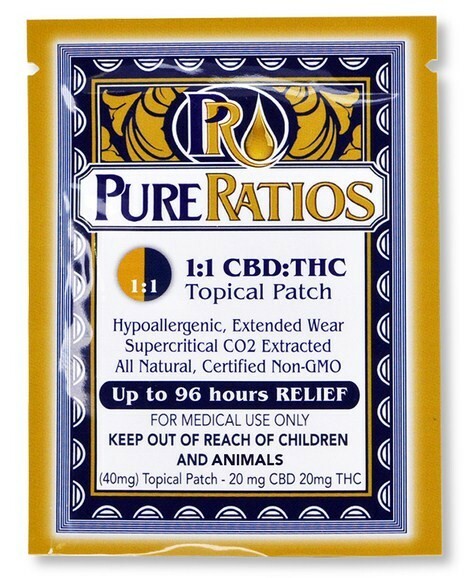 Made from terpenes found in CBD strains, this is ideal for a mellow high with little to no psychoactive effects. Want a more upbeat, refreshing high to sub out for your afternoon coffee? Try Cloud Buster, made with sativa strains and flavored with a hint of tarragon and citrus. 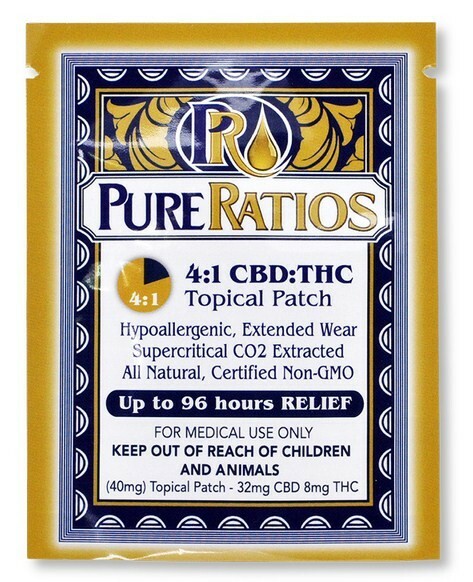 Choose between a variety of dosages including microdose (20 per pack with 5mg THC per slip), standard (10 per pack with 10mg THC per slip), or extra strength (10 slips per pack with 20mg per slip). A pack of Kin Slips run between $20-$35, depending on the dose. This is the most discreet product on the list. 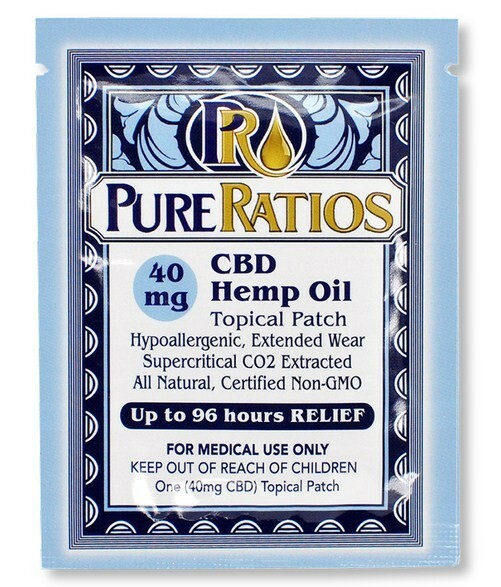 Pure Ratio’s 40mg topical patches dose cannabis right into the bloodstream, with a quick onset. 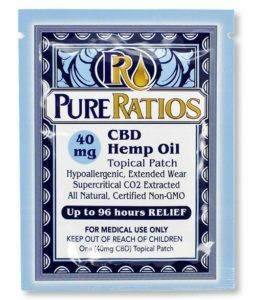 There are no chemicals or additives, setting them apart from other cannabis transdermal patches on the market, to ensure you don’t only absorb the proper medication. 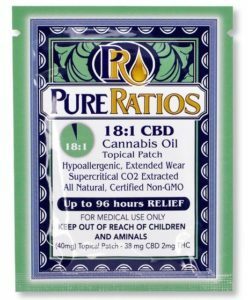 Choose the formula best suited for you from a wide variety of options, including 1:1, 4:1, and 18:1 CBD:THC ratios; as well as a pure CBD hemp oil option. 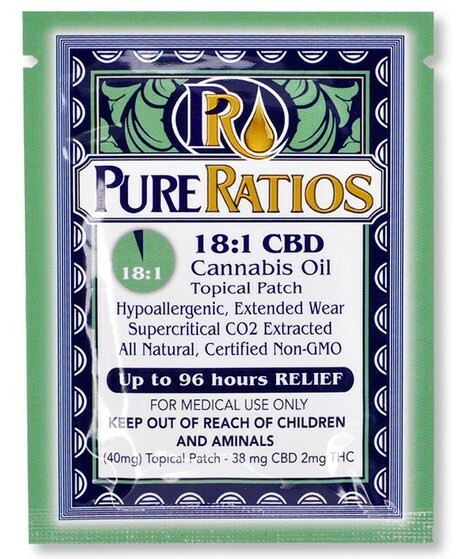 Pure Ratios claim their patches can last up to 96 hours, making $20 per patch very reasonable. Unfortunately, your medical ailments go to work with you. But there’s good news–with these incognito cannabis products, so can your medicine. speaking approximately! Bookmarked. Please also seek advice from my web site =).